If you are interested in conservation biology or ecology, you are no doubt aware that we are currently experiencing a period of rapid, mass extinction. While extinctions have happened many times previously, their causes have been natural. In contrast, the current mass extinction is the result of human activities. With this knowledge it is impossible not to feel depressed at times. And yet I think Lindsey’s post (March 14, 2014), hit on an important, often-overlooked reason for hope: wildlife can be resilient and adaptable. 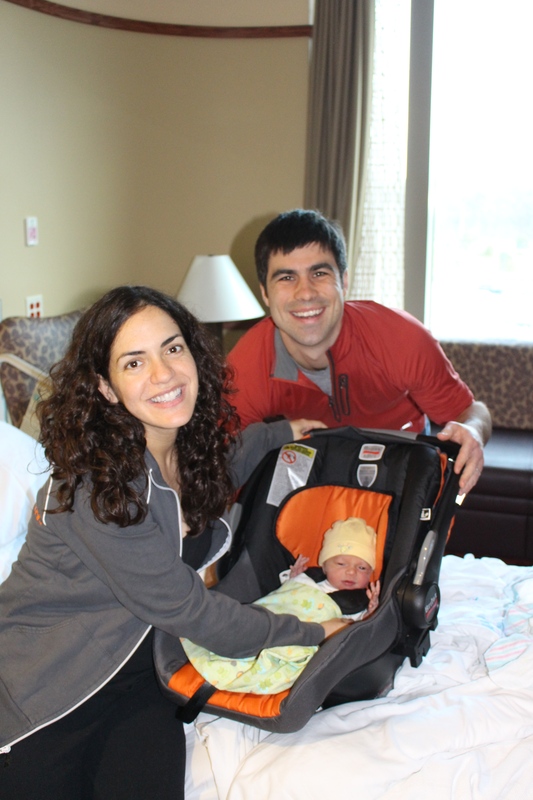 This week I would like to continue the topic Lindsey discussed. She described a pleasant hike in California through a lovely natural area adjacent to the east side of the San Francisco Bay, just west of Berkeley. As she explored further, she discovered that this biodiverse, serene area was actually sitting atop a former hazardous waste disposal site! The abundance of wildlife that had re-colonized the area was a happy ending to an unfortunate era in the region’s history. 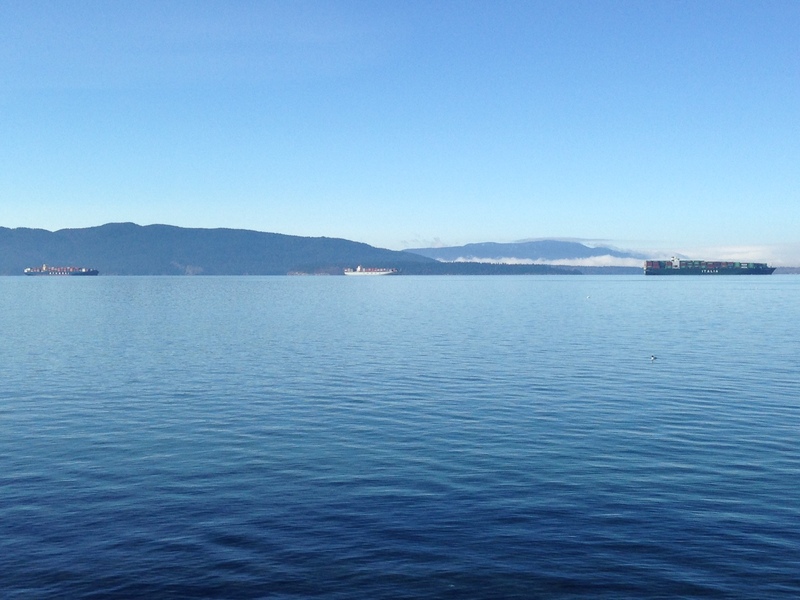 Examples of recolonizations are popping up all over the world – often in unlikely places! I think one of the most interesting aspects of these recoveries is where they are happening: in the hearts of cities! Many cities and other urban areas have recently undertaken massive efforts to restore green spaces, through reclamation of brown field zones, vacant lots, etc. And wildlife has noticed! I recently visited one such place – the Heinz National Wildlife Refuge, in Philadelphia. The refuge preserves the largest remaining tidal marsh in Pennsylvania, along with non-tidal wetlands, woods, and rivers. 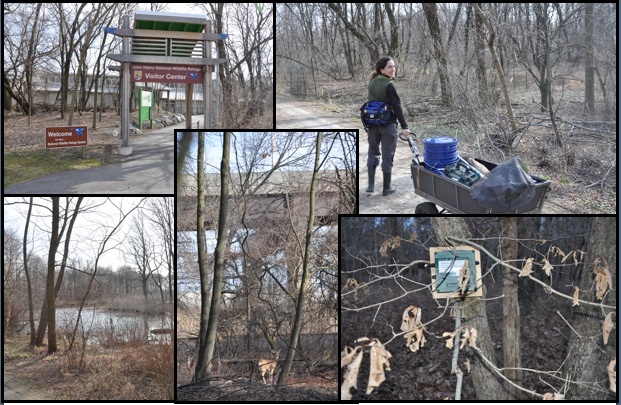 The refuge is home to a diversity of vertebrates and yet it is located in an unlikely area – adjacent to I-95, a heavily utilized railway, and beyond these, the Philadelphia International Airport! As I walked the trails that weave throughout the refuge, I saw owls, shore birds, fish, deer, and turtles. And since I study bioacoustics, I was most intrigued by the odd combination of sounds – an orchestra of traffic, plane and train noise, combined with joyful bird songs and persistent frog choruses. Located adjacent to a trifecta of noise pollution sources (I-95, railway, and the Philadelphia International Airport! ), the Heinz NWR preserves the largest remaining tidal marsh in Pennsylvania. A white-tailed deer standing beneath I-95 observes Jenny as she hikes the trails (bottom center). 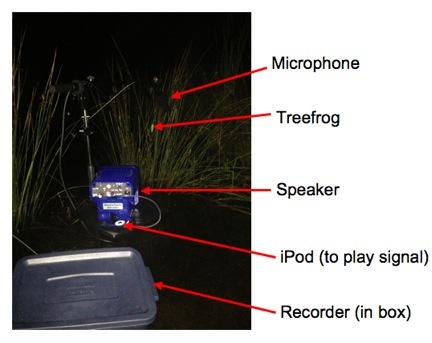 A passive acoustic recorder strapped to a tree allows bioacousticians to spy on wildlife – and the sounds they make – without needing to be present (bottom right). Even if the green space exists, how can these animals, whose fitness rests solely on their abilities to hear each others’ mating calls, survive in such a noisy, urbanized area? I still don’t have an answer to this question. It may be that these species are not doing well at all because of the noise pollution. But perhaps the story is sunnier – maybe those that call the refuge home are somehow adapted to their noisy environment. Or perhaps these species are simply more resilient, hardier species. We can learn so much by studying species that do seemingly well in these urban landscapes and soundscapes, instead of solely focusing on the factors driving the extirpations of others. I think these urban habitats offer us incredible opportunities to explore evolution and ecology! Categories: Fun in the Field, Research in PA | Permalink. 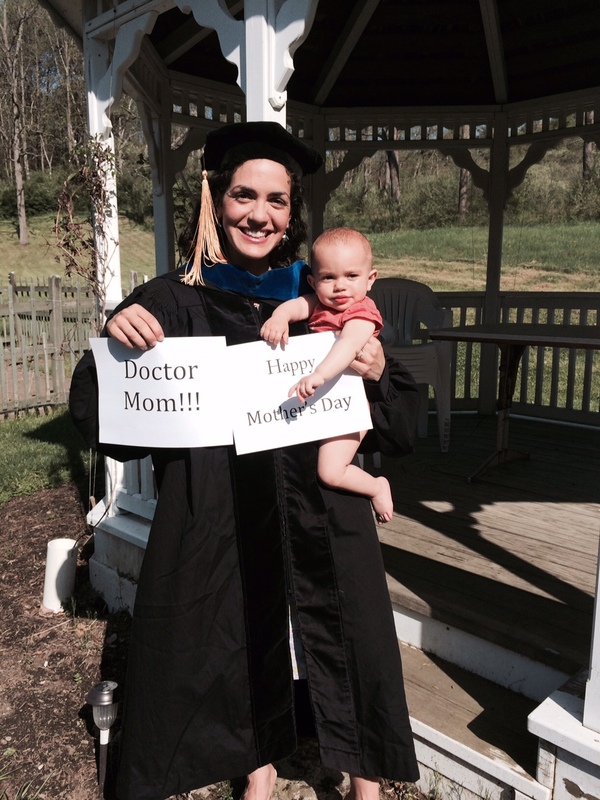 I’m Jenny Tennessen, a doctoral candidate in the Langkilde lab. This week we’re going to leave the world of reptiles behind, to focus on a different order; one that includes animals often characterized by their large eyes, moist skin, and brilliant voices. That’s right, anurans – frogs and toads. Much of my research in the Langkilde lab focuses on how these inquisitive-looking animals respond physiologically and behaviorally to their surrounding acoustic environments. 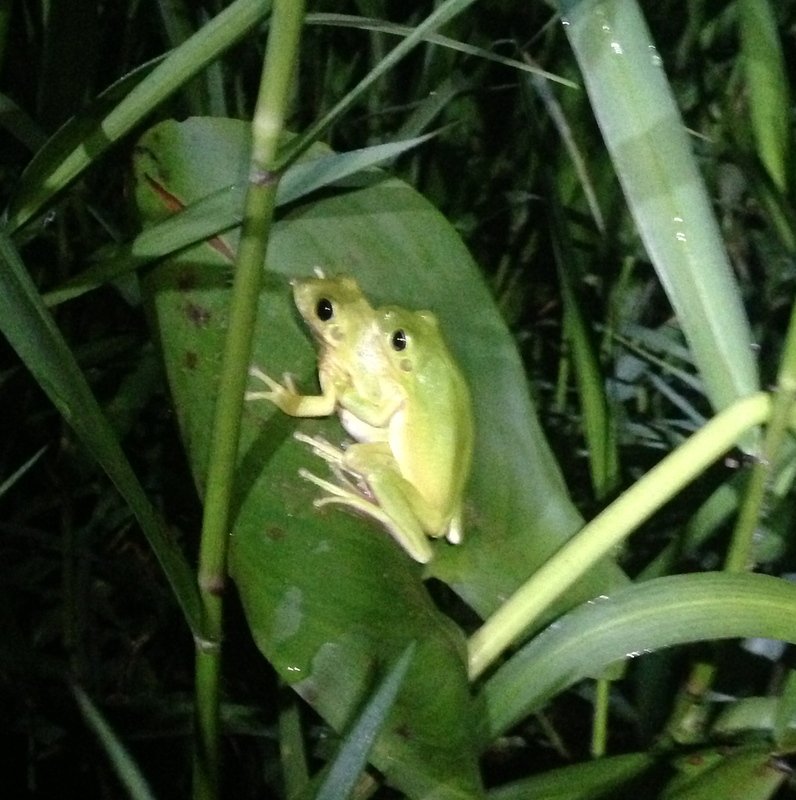 In this week’s blog I’d like to tell you about an exciting project in which I got to chase around treefrogs in the southeast to study their acoustic behavior. You can call me the Treefrog Whisperer. Despite their name, not all treefrogs hang out in trees. They do, however, spend a large portion of their lives elevated on various climbing perches – a behavior facilitated by their relatively small size and broadened toe pads equipped with discs that aid in climbing and grasping. In fact, this body plan is so effective for a life of climbing, that different evolutionary trajectories of treefrogs have resulted in similar body plans through convergent evolution! During the breeding season, treefrogs come down from their aerial perches to breed in water bodies, which can be anything from large lakes with fish to flooded roadside ditches following rainstorms. Have you ever gone for a walk on a summer evening in Florida just after a deluge of rain, and heard sounds so loud you thought you might lose your hearing? If so, the likely culprits included treefrogs, whose post-rain acoustic nuptials can be nearly deafening at the peak of breeding season. A male and female green treefrog (Hyla cinerea) in amplexus. Something interesting is going on in Florida right now – a treefrog war, of sorts, is being waged, though only one side is fighting the war because the other side is mostly naïve to any problems. Cuban treefrogs (Osteopilus septentrionalis), an invasive species native to Cuba and parts of the Caribbean, have been spreading northward throughout Florida since the 1930s or so, having reached the mainland likely as stowaways on ships for the nursery trade. These large treefrogs have gigantic toepads that make them supremely equipped to cling to things – including cars and RVs – and they have hitchhiked all over the state. These unfriendly giants have voracious appetites, and devour unsuspecting native frogs that cross their paths or climb into the same shelters. Because this behavior is unique to the native treefrog community in Florida, it has been very effective. Additionally, their toxic skin secretions help keep them safe from would-be predators. For all of these reasons, Cuban treefrog populations have exploded throughout Florida – in fact, it seems that one of the only natural factors able to limit their populations is cold temperatures during the winter season. After learning about the Cuban treefrog invasion in Florida, I had an idea: since treefrogs use sound to attract mates and defend territories, maybe Cuban treefrog calls are interfering with native treefrogs’ acoustic behavior. There have recently been many discoveries about ways that animals change their acoustic behavior in noisy environments – for example, city birds sing at higher frequencies, and humpback whales lengthen their songs in response to sonar – but few studies have considered the sounds of an invasive species to be a source of noise disturbance. 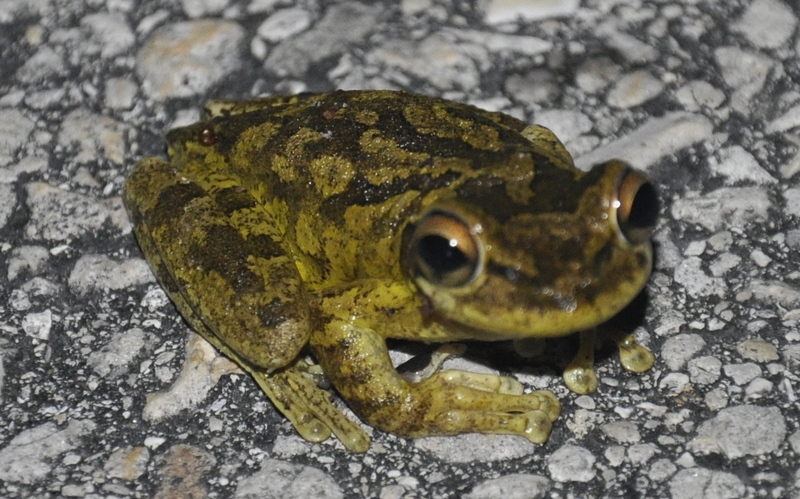 To test our hypothesis that Cuban treefrog choruses interfere (cause acoustic competition) with native treefrog communication, we selected two treefrog species native to Florida: the green treefrog (Hyla cinerea), whose breeding call is very similar to the Cuban treefrog’s, and the pine woods treefrog (Hyla femoralis), which calls at a faster rate and a higher frequency. Click here to see a video of a calling green treefrog and here for a video of a calling pine woods treefrog. 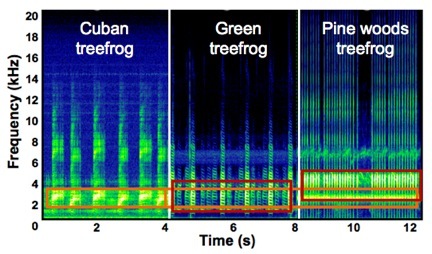 A “spectrogram” comparing the breeding calls of Cuban, green, and pine woods treefrogs. Greater acoustic intensity is illustrated by lighter coloration. The orange box that continues across the graph illustrates the frequency range of greatest energy for Cuban treefrogs and the portion of green and pine woods treefrog breeding calls with which it overlaps. The individual red boxes illustrate the frequency ranges of greatest energy for green and pine woods treefrogs. It is clear that Cuban and green treefrog breeding calls are similar in rate an frequency, whereas pine woods treefrog breeding calls occur at a much greater rate with most energy at a higher frequency. We approached these treefrogs as they were calling from perches on grasses above the water, and played recordings of Cuban treefrog choruses (or control sounds within or above the frequency range of the Cuban treefrog chorus). 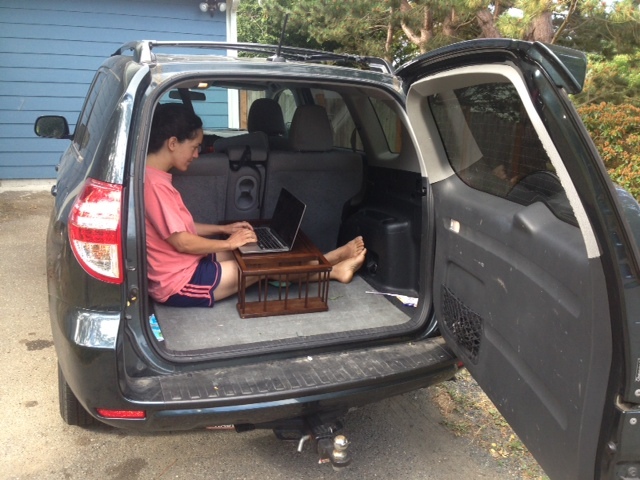 We made acoustic recordings of their pre-, during- and post-playback acoustic behavior. If our hypothesis was correct, we predicted we would see that species with more similar acoustic behavior (green treefrogs) would change their calls, whereas those with less similar acoustic behavior (pine woods treefrogs) would not. The setup for our acoustic playback experiment. Lots of expensive acoustic equipment suspended over the water! Fortunately nothing went for a swim. We are still in the process of analyzing the data but I’ll share one of our most interesting discoveries so far. In response to Cuban treefrog playback, green treefrogs increased their call rate by up to double the original rate, while pine woods treefrog call rate did not change! These results are consistent with our predictions, and lend support to our hypothesis that sounds from invasive species can interfere with native species’ communication. We are still exploring other acoustic parameters that green and/or pine woods treefrogs may modifiy to avoid interference, including call frequency, duration, and intensity. To learn more about this work, check out my radio interview on Quirks & Quarks, or feel free to email me (jbt148@psu.edu). Categories: Fun in the Field | Permalink.